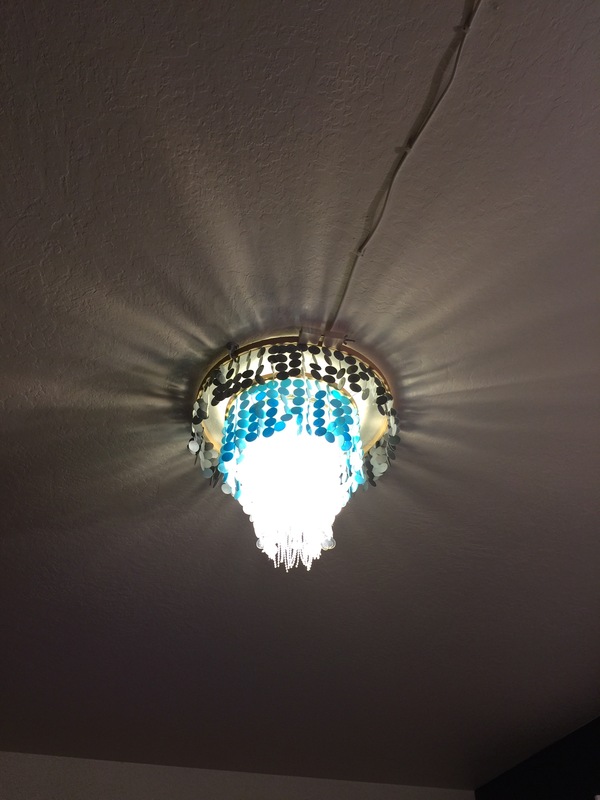 To make this spiffy light fixture, I trolled the estate sales and thrift stores and party supply stores for only a few items. – a decorative scrapbooking hole punch (I went with a 1″ plain circle, but you could do stars, other shapes, etc. 1. Nest your rings and determine which colors will be assigned to each hoop, and how long you want each consecutive layer to be. My outer layer is shortest, 5 circles long, and each circle toward the center gets longer and changes color, till I get to the innermost circle, which is only beads. 2. Disassemble the embroidery hoops. Work from the innermost circle, outward. I cut equal lengths of the beaded strand, and looped it over the smallest inner hoop. When all the beads were tied (can be glued) in place around the ring, I set it aside. 3. Measure the next hoops circumference and determine how many strands of confetti you want to have. In my case, because I had a 1″ hole punch, each strand was an inch apart, but you could easily move them closer together. Once you have an idea of how many strands you want, multiply that by how many “circles” you want in each strand. For the inner hoop on mine, it was seven. So if you wanted 15 strands of 7, that’s 105 clear circles. Calculate this for each color. 4 Once you’ve calculated how many circles of each color you need, use the hole punch to cut out as many as you can squeeze out of each plastic plate (I cut the edges off first). I managed 25/plate, which meant that in 5 plates, I could get enough circles to cover that 105. This will help you know how many plates to save. 6. Once you have all your strands finished, glue them to the OUTSIDE of each inner embroidery hoop. Meaning that you’ve taken the hoops apart, and all the glue and ugly stuff is on the inner hoop. 7. This step may confuse you. When each hoop is finished with all the strands attached, use more fishing line to tie the inner hoops to the outer hoops. There were 4 hoops in mine, so let’s call them all by letters. The largest hoop will be hoop A, with an inner and outer hoop. 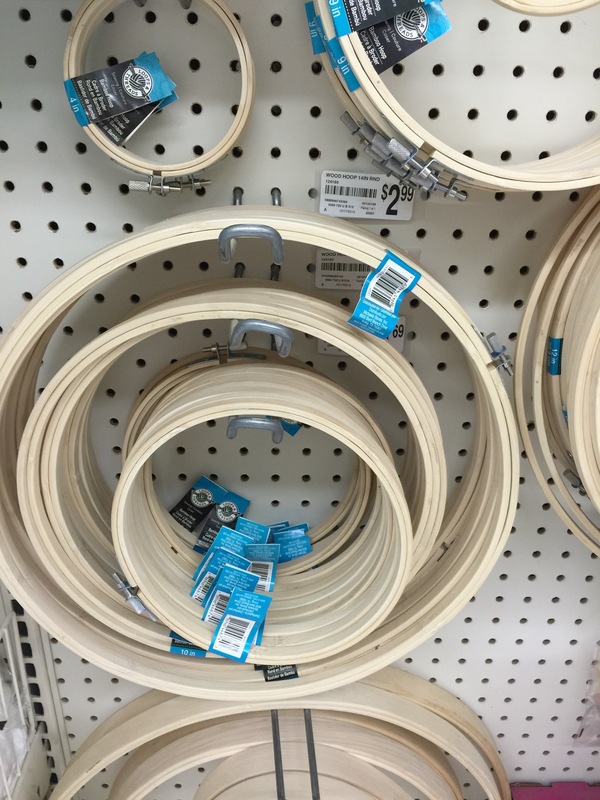 So in mine, hoop A inner was tied to hoop B outer, hoop B inner is tied to hoop C outer. Then all the pieces just pop and tightened together using the flanges provided on the embroidery hoops. This means that the outer surfaces are all clean and smooth. 8. I secured this to the ceiling using 3 ceiling hooks that hook over the embroidery hoop exactly. 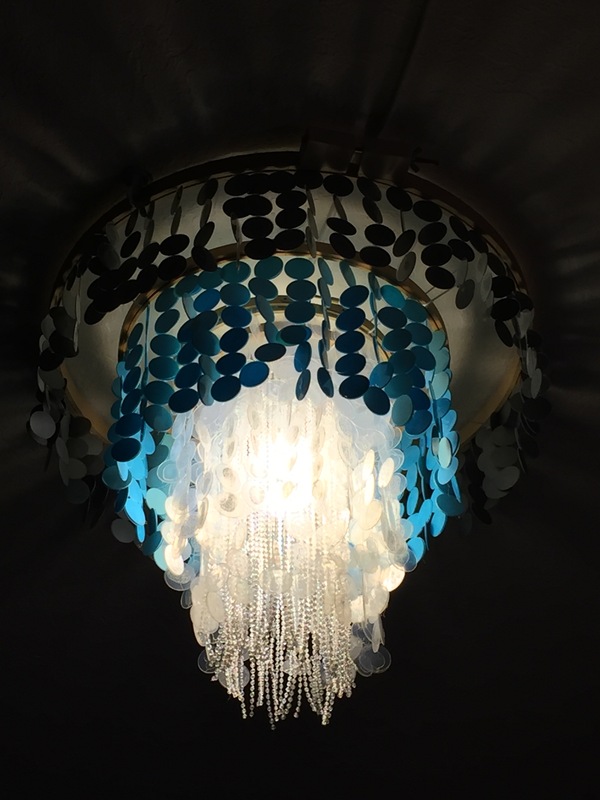 It will hang away from the ceiling by almost the exact amount of space needed to insert a cord (ikea standard light bulb cord). 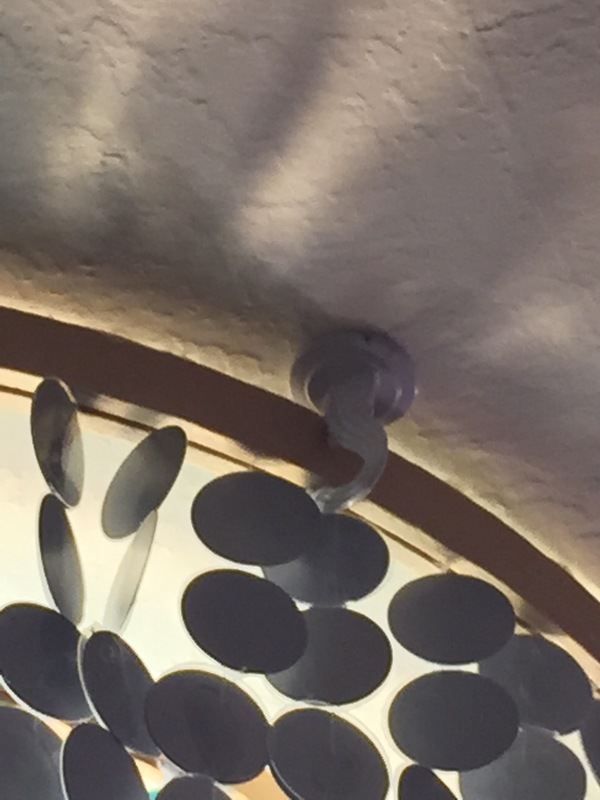 This fixture can handle almost any bulb, as the bulb touches nothing and does not put out enough heat to melt the glue. You could use practically anything, old beads, bits of chain, even yarn might be cool. You could spray the hoops to look metallic, etc. endless possibilities.